The SmartMedia LFD monitors for Digital Signage, have a simple and elegant design with rounded corners, ideal for any decor and location. Reliable, strong screens, designed and tested to operate continuously 24 hours a day, 7 days a week in addition to low power consumption. They can be equipped with touch screen capability (optional) and increased brightness to be placed high light areas. You can choose different model sizes and features: 32" to 84" with resolutions ranging from Full HD to 4K. 1.5 GHz Quad Core with 8 GB of internal memory that supports playback of many types of media. The integrated USB reader supports most common file formats for images, audio, and video: RMVB, MPEG-4, DivX, XviD, H.264. They are equipped with Wi-Fi, SD card reader, and a simple software for Digital Signage Cloud control Included: SmartMedia SmartSignage. The LFD monitor or kiosk dedicated to digital signage, is managed via an Internet connection or locally programmable. 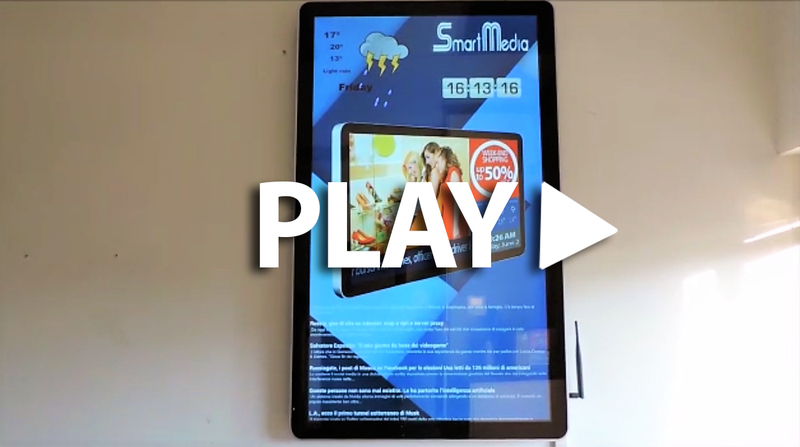 Each LFD Monitor (Player) comes with SmartMedia SmartSignage [1 year free], the software for Digital Signage that allows the management of one or more devices, the orientation of the screen to load media files to the schedule management. Individual device attributes can be managed remotely via WiFi or LAN or locally via USB port. The end user can control features such as screen orientation, file uploads, and campaign scheduling. The program for communications and multimedia files can be setup in a continuous loop mode or specific scheduling can be deployed. display comes in 32" to 84"
CHOOSE SMARTMEDIA MONITORS for DIGITAL SIGNAGE! Diagonal 32" 42" 46" 55" 65" 70" 84"
Dimensions (in) 30.3"x18.4"x 2.2" 38.5"x27.55"x2.2" 48.8"x25.9"x2.2" 50.6"x29.8"x2.2" 60.7"x35.8"x2.2" 65.3"x38.8"x4.4" 76.96" x 45.07" x 3.14"
Each LFD Monitor (Player) comes with SmartMedia SmartSignage [1 year free], the software for Digital Signage that allows the management of one or more devices, the orientation of the screen to load media files to the schedule management. Individual device attributes can be managed remotely or in local network via WiFi or LAN. The end user can control features such as screen orientation, file uploads, and campaign scheduling. The program for communications and multimedia files can be setup in a continuous loop mode or specific scheduling can be deployed. Each monitor on the network can host and manage its own customized schedule, as well as the reference template that contains the style settings such as background colors, effects and transition times, and the speed of scrolling the titles. Each screen can be divided into several areas of administration, accommodating many file formats. Within each area, you can schedule the publication of video, images, weather information, date / time, subtitles, a company logo and a link to a preset website. File formats supported are: (Jpg, gif, bmp), video (avi, mpg, mp4), text (.txt), audio (mp3, wav). By using images and personalized videos, organized in a program designed specifically to manage multiple campaigns, the products and the information are displayed in a more interesting way making a lasting impression on the interactive user. Digital Signage and Kiosks located in multiple locations can be controlled to manage the flow of information to customers whether advertising or providing up to date information. AIRPORTS AND TRAIN, BUS, AND METRO STATIONS: Convey information with a touch of class. UNIVERSITIES AND SCHOOLS Keep students informed of campus events, make special announcements, or recognize student achievements. HOSPITALS AND CLINICS: Provide interactive detailed information to patients or notify patients of specific services and the best way to take advantage of them. WAITING ROOMS: Display order and wait times for receiving care. SHOPPING CENTER OR SUPERMARKETS : The goal is to bring back the customer for next purchase . Which kind of new events are you planning to propose ? Digital signage is becoming widely used in many types of businesses such as: fashion, restaurants, retail outlets, etc. A valuable asset to any business that has high customer traffic or many employees. A comfortable, flexible, manageable tool, for immediate control to any business promotion, shows or service. Keep customers and employees informed. Strategically placed signage in corridors and tour locations for cinemas, theaters, expositions, and museums. Amaze and entertain audiences by showing live backstage feeds, actor or director interviews, special promotions. Provide a positive experience for adults and children both through interactive displays increasing retention of information.